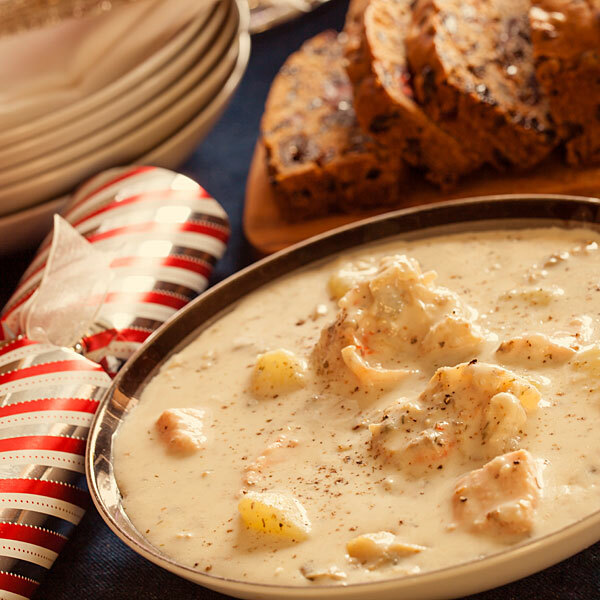 This delicious chowder needs to sit for at least 24 hours for the flavors to marry. We enjoy it with popovers, broccoli salad, applesauce and pumpkin pie for dessert! Melt the butter in a heavy soup pot over medium heat. Add the onions and cook until soft. Add the clam juice (or water), bay leaf, celery seed and potatoes. Cook until just fork tender. Add the haddock and dairy. Slowly bring to a simmer. Remove the bay leaf. Season with the sea salt, fresh pepper, parsley, and garlic salt. Allow chowder to cool before transferring to the refrigerator. Let sit at least 24 – 48 hours before serving. To serve, reheat slowly in a heavy soup pot over low heat. Serve in heated soup bowls. Nutritional analysis per serving: 372 calories, 20 grams protein, 13 grams carbohydrates, 27 grams fat, 351 mg. sodium, 1gram fiber. Who’s Martha? The volunteer that helped me make 6 batches of chowder to feed 300 people and inspired this version to make at home.